Different types of Salami are used for the purpose of coating the outer casing with herbs, which serves to enhance the flavor of the meat both inside and out. 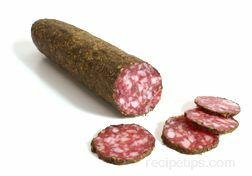 Hand rolled in fine bits of herbs, , the Salami is encrusted in with one herb and other seasonings such as pepper or several varieties of herbs such as Herbs de Provence. After the herbs are securely adhered to the outer casing, the meat may become only lightly flavored internally, while the encrusted herbs add more to the flavor of the meat overall as it is consumed in slices on other foods or as an appetizer.